I fell in love with chicken hearts when I had them as part of an offal appetizer at Blue Hill NYC. Oft-neglected and under-appreciated, they taste like little nuggets of dark chicken meat with a slightly metallic aftertaste (c'mon, think of all the blood they pumped), and their chewy texture is further reminder of how hard the little muscles used to work. Hearts and their "odd part" cousins (think tongue, liver, tail, and other byproducts of butchery) aren't frequently stocked at local grocers so when I found some at the farmer's market last week I pounced. The curious farmer left me mulling over how I was going to prepare the little organs, but the warm weather had me antsy to grill, and the size of the hearts makes them perfect for skewering, so that's the route I took. Piercing and grilling hearts on a stick might be somewhat of a romantic taboo, but the results are delicious. 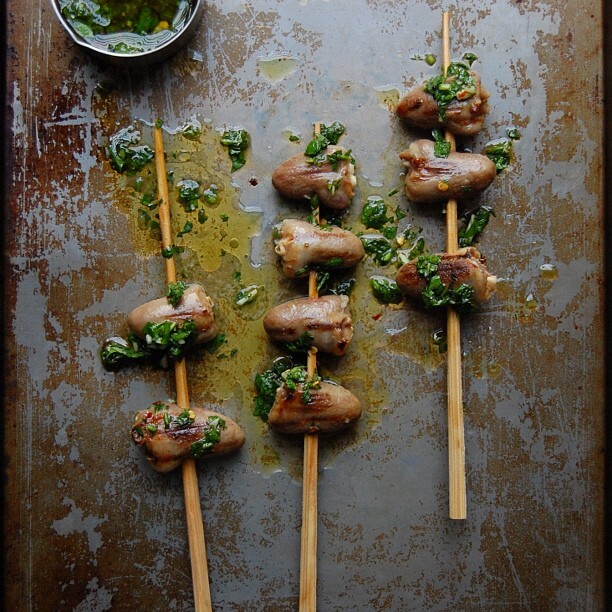 Taking inspiration from this Gourmet recipe, I brined the hearts for several hours, threaded them onto brochettes (homemade from whittled-down chopsticks), then grilled them and served with a fresh herb vinaigrette. I was restricted to using a cast iron grill over the range, but the hearts would really benefit from an open fire grill so they could take on the smoky flavor of wood or charcoal. 1. Combine 1 quart cold water with 2 tablespoons sea salt and 1 teaspoon sugar. Stir until dissolved. Add chicken hearts, cover, and chill for 3 hours. 2. Drain chicken hearts. Thread hearts onto presoaked wooden skewers, leaving about 1/2 inch between them, and place between paper towels to dry. 4. When grill is hot, brush chicken hearts with olive oil and sprinkle with sea salt. Place skewers over heat and cook, turning occasionally, 3 to 5 minutes total. 5. Serve with parsley vinaigrette. Those have to be the prettiest chicken hearts I've ever seen! I like the idea of dark chicken meat nuggets. I've had grilled chicken hearts when in Tel Aviv, Israel, and also in Tokyo, Japan at yakitori joints. They are so great, we love them for the exact reasons you do: chewy, little morsels of dark meat-goodness. Thanks for posting a recipe!